BLAINE, Minn. — Six bids, six favorites moving on to Nationals. There was little drama in the North Central if you were hoping for a surprise qualifier, but the Men’s and Women’s finals were both nailbiter affairs between evenly matched teams. Over in the Mixed Division, Drag’N Thrust asserted their dominance as they gear up for a deep Nationals run. It was all chalk for the women in Blaine, and the final was one you could see coming from a mile away: #13 Madison Heist vs. #14 Minneapolis Pop. The final was an upwind/downwind game, with neither team managing to break upwind the entire first half. While the second half featured multiple breaks, the game still eventually came down to double game point, with Pop receiving going downwind. A contested call from Robyn Wiseman went to the observer, who upheld the call, giving Heist fantastic field position. A few throws later, Heist claimed the “upset” and the region, 13-12. No. 3 seed Kansas City Wicked, while extremely talented, simply didn’t quite have the depth to hang with either of the big two. Claire Frantz was slinging, Grace Roth was getting layout blocks, and Taylor Simpson was consistently open, but in the end, it just wasn’t enough. In the game to go, Biz Cook, Makella Daley, and Courtney Kiesow led Pop to a 12-8 win and claimed the final ticket to San Diego. Cook, a big, dominant downfield cutter by trade, was moved by coach Jon Gaynor into a primary D-line handler spot this weekend. She ran the show and ran it well, using her lateral quickness and length to provide easy resets after a turn. The Men’s Division was also a predictable affair, with #8 Madison Club and #7 Minneapolis Sub Zero remaining relatively untested until the final. With no Ryan Osgar for Sub or Colin Camp for Madison, both teams were without their primary cutter, but initially it was much more noticeable for Minneapolis. With the score on serve 3-2, a series of mistakes from Sub’s O-line allowed Club’s athletic defense to secure two breaks. But Sub came roaring back out of half, eventually knotting the score up at 8-8. Sub’s defensive strength lies in its modestyL there isn’t one guy that tries to be a hero, who needs the disc at all times. It’s a defense by committee, and it works for them. The rest of the game was pretty ugly. There were several multi-turn points, punctuated by a couple of bad Club bids and a Peter Graffy sky and subsequent spike near Colin Berry’s face (which was booed heartily by onlookers). They’d eventually go to overtime, and then sudden death with the score 14-14, Sub receiving going downwind. Sub’s Charles Weinberg doinked one on Sub’s half of the field, but got it back with a grab on a floaty Club huck. The second time was the charm, as Sub patiently worked it the length of the field until Alex Simmons hit Greg Cousins for the regional title and Nationals berth. The second place game, initially, looked like it was going to be something momentous. #22 Kansas City Prairie Fire, even without star Brett Hidaka (who hurt his knee against Sub the previous day), roared out to take half 7-5. But then Kevin Pettit-Scantling and the rest of Madison’s D-line woke up. An 8-2 second half for Club earned them the win and the final North Central slot in San Diego. In sharp contrast to the Men’s and Women’s Divisions, the top two teams in Mixed are going to Nationals! Not much to report for #1 Minneapolis Drag’n Thrust. They were clearly the best team in the region, with their closest game being a 13-8 drubbing of CLX. Their handlers deftly worked through the wind, while their defense was suffocating. Sarah Meckstroth, Caleb Denecour, and the rest of the gang look primed for a deep Nationals run. #13 Minneapolis No Touching!, when they wanted to, looked head and shoulders better than everyone but Drag’n. The no. 2 seed absolutely demolished a very talented NOISE squad in the game to go, as Graham Brayshaw, Sam Valesano, and Patrick Jensen exerted their will. The biggest problem No Touching! had, actually, was when they were forced to take down their famous banana stand. Further details are forthcoming, but as far as ultimate goes, they’ll head to the Club Championships with their sights set on a quarterfinals berth. #20 Madison NOISE, meanwhile, misses Nationals for the first time since 2014, a side effect of having just two bids. There’s no doubt that NOISE, while perhaps a little weaker than in previous seasons, can hang on a Nationals level. Dayu Liu and Tom “Animal” Annen, in particular, looked strong all weekend, using their fantastic chemistry as the team’s primary O-line handlers. Expect NOISE to come roaring back next year as the NC’s Top Select team. 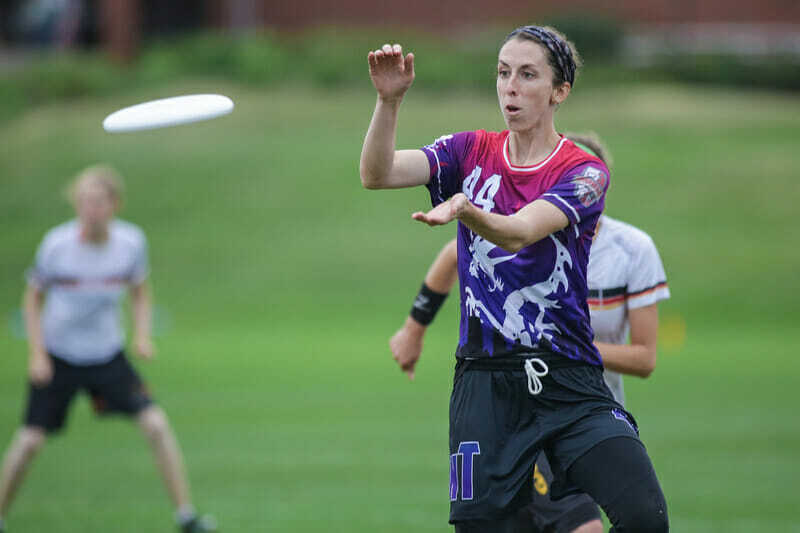 Comments on "North Central Regionals 2018 Recap: Favorites Advance, Drag’N Dominant"